Watch out! A running raccoon is loose in the Rounces’ living room. Oops! 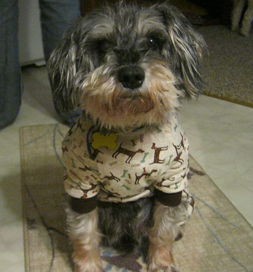 No, it’s just Theodore, the family’s adopted Miniature Schnauzer, who is over 14 years old, is deaf and almost blind. The family loves to see him romp so cheerfully, but they also cringe for fear he will run into the coffee table. Theodore’s special needs are mitigated by his family’s loving care and concern. The family adopted him from Alger County Animal Shelter in Munising, MI, after seeing him on Petfinder. A vet had suggested he be euthanized because of all his “conditions,” which also included arthritis and a lack of muscle mass in his back legs. His sweet personality saved him from euthanasia. He does require some extra considerations. “You can’t just walk up behind him and pet him,” Penny says. “Doing that startles him and makes him wonder who or what is touching him.” Instead, they put a hand on his nose, he sniffs, realizes he is safe, sighs deeply and relaxes. His muscle mass has strengthened by taking walks, first just to the end of the driveway and back. “Now he loves trotting through the trails in the woods,” Penny says, with his people, of course, as guides. Theodore’s zest for life reminds those who meet him that “conditions” don’t always have to put a damper on attitude.